Cheap Las Vegas realty signs are available for realtors in the Las Vegas area. Most real estate agents use a yard sign at a listing in order to let people passing by that the property is ” For Sale” and also to get their name noticed. Cheap Las Vegas Realty Signs usually include the name of the listing company, the agents name, the contact information of the agent ( telephone number and email address of the agent) and the MLS or Realtor symbol. These real estate yard signs are usually 18″ high by 24″ long and are made out of aluminum. The aluminum substrate is important as aluminum will not rust and there is nothing worse than a beat up rusting sign in front of a nice house. Many agents also choose to add a 6″ x 24″ rider that hangs from the “For Sale” sign so that additional information about the property can be displayed. For example, the words Pool, Casita, Solar, etc. might be great descriptive words to help identify positive aspects about the property for sale. 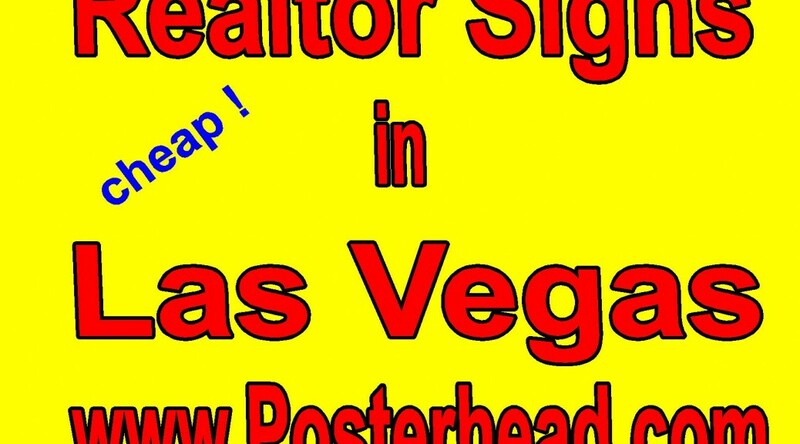 Cheap Las Vegas realty signs might also include coroplast or plastic signs. These throw away signs are great for one time use and then are tossed at the end of a successful listing. Many agents that specialize in foreclosures like to use disposable signs because of the cost involved. Several sign companies associated with the GLVAR offer a discount to GLVAR members. The GLVAR has a unique program that tries to encourage partnerships with local businesses ( Member Benefit Program) and as a result, the GLVAR has lined up businesses that will offer a discount to GLVAR members. You should contact the GLVAR or your local sign shop to see if they are a member of this mutually beneficial program and save yourself some money with your realty signs. Las Vegas media wall banners are being used at press conferences and special events at a growing rate. Las Vegas media wall banners are very popular and inexpensive for special events like movie premieres, grand openings and news conferences. Las Vegas media wall banners allow for a background banner to contain the logo or name of the event sponsor. The logos or names are methodically placed on the banner so that from no matter what view point, the logo or name is recognizable and is photographed or videoed in the background. This gives publicity to the sponsors name. Imagine if a celebrity like Kim Kardashian had her photograph taken against a background where the name of a company appeared. That company name would be literally be seen by hundreds of thousands of people looking at her photograph. That is a lot of publicity for a company sponsoring an event. Las Vegas media wall banners are cheap and inexpensive. The average cost of a matte finish wall banner is around two dollars a square foot. A simple 10ft x 10ft media wall banner would cost around $200.00. The wall banners can be taped or fastened to a wall or there is an adjustable banner stand that allows for the banner to be moved freely with little effort. A matte banner finish is always used so as not to reflect light or a camera flash like a glossy banner finish would. Las Vegas media wall banners come in a variety of sizes. It is important to match the size of the media wall banner with the event. A simple nightclub in Las Vegas that needed a background step repeat banner would probably be able to get away with a 8ft x 8ft size. A movie premiere with many stars would need a much larger background banner so that multiple photographs could be taken at one time. Las Vegas realtor rider signs can assist a realtor in making a sale on a piece of property. Rider signs are 6″ x 24″ signs that hang below the real estate sign that just gives a little more information on a piece of property that the general real estate sign does not. Las Vegas realtor rider signs are made with an aluminum substrate to prevent rusting and are usually the size of 6″ x 24″. The rider sign can be full color( both sides) abd have a variety of descriptive terms on it to help identify the property to potential buyers. etc. all help identify the property in such a way that the regular real estate sign cannot. The realty riders usually cost around $10.00 each for a custom rider. If you buy plastic riders, the cost goes down but also the quality and life expectancy of the sign. 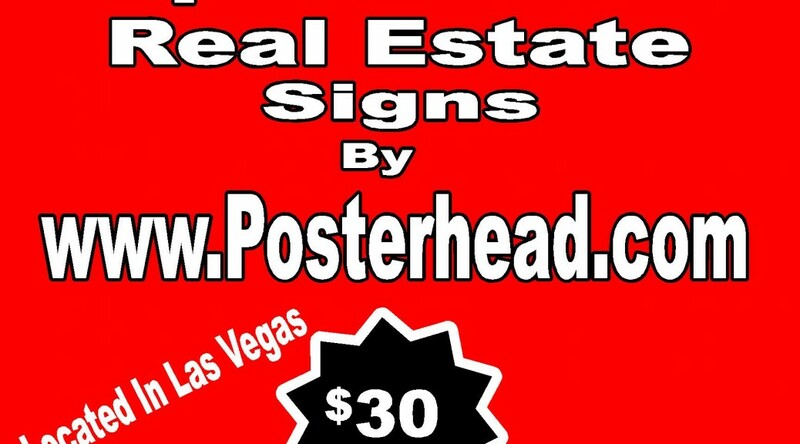 Las Vegas real estate signs are made with an aluminum blank and measure 18″ x 24″. They have the company name, sales agents information and contact information to get hold of the company or agent. Open house signs are 18″ x 24″ and usually contain the company name or logo, “Open House” descriptive term and an arrow pointing out the direction in which to travel to find the open house. They are a generic sign that is put at various points in the neighborhood to draw interest to the open house. In Las Vegas, most realtors belong to the Greater LAs Vegas Realtors Association or GLVAR. This is a wonderful organization that assists agents in the community and sets the standards and practices for the agents. Many sign companies in the area belong to a mutually beneficial program to encourage interaction between the sign shops and the GLVAR. Contact you local sign shop to see if they are a partner with the GLVAR. They will offer you a discount on services if they are. Las Vegas rush order same day banners are available in the Las Vegas area. Because they are a rush job, it is important to have the design already done or if the design needs to be completed, it can done expeditiously. Las Vegas rush order same day banners can be made if there is time. Many times companies find themselves without their graphics in Las Vegas because of unusual circumstances like airline loss, damaged in transit or maybe they were simply forgotten back home. The show must go on and if you need those graphics and signs because of a trade show, there are numerous sign companies in Las Vegas that understand your needs and will try to assist you in making that graphic. Vinyl banners dry very quickly with the inks that are used in the industry today. There is usually not a waiting time for the banner to dry because fans are blowing on the vinyl banner as soon as the banner is printed. There are also pre heaters on the printers and after printers on the printer that heat up the material and then heat the print to help make it dry faster. On regular signs that are printed on vinyl material, there is a curing time that is needed for the sign to be fully dry which is usually a day or two. Las Vegas rush order same day banners are not going to set you back an arm or a leg either. If the sign shop has the capacity, there is not usually a fee attached to your same day service. However, if the sign shop has to rearrange its production schedule to accommodate rush orders, there might be a small fee associated with this inconvenience. Contact your local Las Vegas signs company for your rush order same day banners. Las Vegas commercial vinyl banners are being used by businesses for a variety of reasons. These commercial banners are being found to be a cost effective approach to marketing a business or event. Las Vegas commercial vinyl banners are being used by real estate agents instead of the traditional aluminum signs. The aluminum signs are more expensive and commercial vinyl banners offer a cheaper way to get the same information across to clients but at a cheaper rate. Why pay a few hundred dollars for a 4ft x 8ft aluminum sign when you can pay less than $70 for a commercial vinyl banner that can last well over a year in the outdoor weather of the Las Vegas area. When placed against a building or a solid object, these Las Vegas commercial vinyl banners can last a very long time. Eco solvent ink used on these banners wears very well in the hot summer months in Las Vegas . Las Vegas commercial vinyl banners are being used by businesses along freeways and major streets. These smart businesses are taking advantage of their empty space on the exterior of their buildings by placing large banners on their property so that they can be seen by the thousands of vehicles that pass by their stores everyday. The 95 freeway and 15 freeway interchange is a prime example of smart businesses placing large banners on their buildings that act as billboards, but without the monthly rental fees. 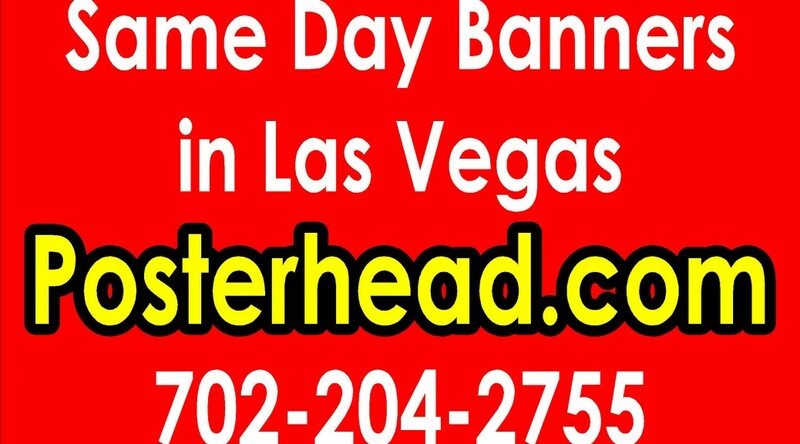 These large banners can be purchased at sites like www.LasVegasLargeBanners.com. Once paid for ( at around a couple of bucks a square foot ) they will last a long time and can be taken down and stored to be reused over and over again. Many businesses rotate their banners so as to give their store a fresh and new look. Las Vegas commercial banners can be found at local signs shops near you. Las Vegas Large Real Estate Signs. Las Vegas large real estate signs are available for commercial listings in the Las Vegas area. Las Vegas commercial property listings usually have larger signs to identify the status of a property. Las Vegas large real estate signs are needed to convey the property in more detail as to such issues as zoning, size, land size and other important features of the property. Las Vegas large real estate signs can be a variety of sizes and shapes. However, the two most common commercial sizes are the 4ft x 4ft and the 4ft x 8ft commercial real estate sign. Both these aluminum signs ( aluminum is the preferred substrate because it will not rust and will last a very long time in different climate conditions) are great sizes to be seen and are easily readable at distances. The four foot by four foot real estate sign ( in full color) goes for about $100 and the four foot by 8 foot sign goes for around $175.00. 4 x 4 posts are the preferred method of holding up the sign but also adhering the signs to the building is a more economical way to go. Las Vegas large real estate signs can also be made with large vinyl banners that can be placed on the perimeter of the building or property. These large banners can have all the information necessary placed on them to get the building noticed. They are much cheaper than a traditional aluminum sign and are sometimes preferred for a building that is thought to be able to be sold or rented out easily. After all, why pay the additional expense of a aluminum sign if it is not necessary. Las Vegas large real estate signs are available through many of the local sign shops in the Las Vegas area at very reasonable prices. A simple online search will find a sign shop near you. Las Vegas press wall banner printing allows for background banners to be used as backdrops so that pictures and video can be taken against a chosen background. Las Vegas press wall banner printing usually involves a logo or name to be methodically placed on a banner in a step and repeat fashion so that no matter what angle a photograph is taken from, the name or logo in the background can be seen. Sponsors of events and concerts will pay a lot of money to have their logos and names included on the Las Vegas press wall banner printing ( also known as step and repeat banners). This form of advertising is very cheap and gets much notice in newspapers and tabloids, especially when a very important person ( VIP) is associated with the product. It acts as a form of endorsement and a cheap way to get your company name seen by thousands of people. Las Vegas press wall banner printing is not expensive. It usually costs about $2.00 a sq. ft. for a step and repeat banner to be printed on a matte banner material. A matte banner material is used so that there is no flash or light reflection cast by the background banner. If you were to use a glossy finish ( typical with vinyl banners) the flash of the camera or bright lights would reflect onto the banners and possibly ruin the photo. These step and repeat banners are usually either grommeted on the perimeters every two feet or simply have no grommets and are then taped to a wall by double sided tape or Velcro or stretched out by the grommets. Many times, people just use an adjustable banner stand that holds the step and repeat banner and then that banner can be placed at any location they choose instead of against a wall. Realtor for sale signs for GLVAR members are available in the Las Vegas area to assist GLVAR members in getting the proper signage for their trade. These signs come with the name of the real estate company, name and contact information for the realtor and logos like the Equal Opportunity Housing sign, Multiple Listing Service Sign and the realtor sign if the end user wants them. Realtor for sale signs for GLVAR members are traditionally the size of 18″ x 24″ and are on an aluminum substrate that can last many years in all weather conditions. The aluminum will not rust like conventional steel or other metal substrates that have tendency to corrode after being exposed to different climate conditions. These aluminum blanks are covered with vinyl plotting or a full color vinyl print so that the proper information can be displayed on the for sale sign. Many subdivisions in the Las Vegas area have unique sign requirements that are set by the Home Owners Associations ( HOA) in their area and real estate agents are bound to comply and respect those rules. For example, one HOA requires a unique oval shaped sign instead of the rectangular 18″ x 24″ realtor sign. Realtor for sale signs for GLVAR members are not expensive. The price of a realtor sign is about $30.00 in the Las Vegas area. The GLVAR , Greater Las Vegas Realtors Association, has forged partners with many local businesses in the Las Vegas area that offer help and discounts to GLVAR members. To be a member of the GLVAR member benefit program, businesses are required to be in good standing with the GLVAR and offer a discount to their members. Consequently, if you find a sign shop in the Las Vegas area that is a member benefit partner of the GLVAR, they will give you a discount off their already low price for signs. Las Vegas Cheap Step Repeat Banners For Events. Las Vegas cheap step repeat banners make for great backdrops at events and parties. Las Vegas cheap step repeat banners are made for backgrounds so that photographs and videos can be taken with the backdrop in the background. Many companies pay big money to have their names or logos on Las Vegas cheap step repeat banners. At parties and events, these step and repeat banners are placed strategically at a location so that photos and videos can be taken in front of them. These step and repeat banners have logos and company names methodically placed on the banners so that from no matter what angle a photograph or video is taken, the names of the sponsoring companies or their logos are seen in the background. Publicity is obtained from these photographs when the public gets to see them in newspapers or television. Las Vegas cheap step repeat banners can be many sizes so as to accommodate the needs of the events. The standard sizes , if there is one, seems to be a 8ft x 8ft step and repeat banner and a 10ft x 10ft step and repeat banner. There are adjustable step and repeat banner stands that can accommodate various sizes and are reusable. Las Vegas cheap step and repeat banners are printed on a matte finish material so that there is no flash reflection in the photographs or videos. If pictures are taken against the gloss finish, there tends to be a flash reflection that takes place. Step and repeat banners cost around $2.00 a square foot and can be hung with tape or grommets can be placed on the banner. Las Vegas cheap step repeat banners can be found at local sign shops in the Las Vegas area. Simply search online or through the telephone book to find a convenient sign shop near your location. GLVAR Real Estate Signs are available for sale to members of the GLVAR. The GLVAR has extended business opportunities and partnerships with the local business community to help GLVAR members with their real estate signage needs. As a result, sign companies have partnered with the GLVAR to make sure their members have the best signage available to them at a discounted price. To be a member benefit partner of the GLVAR, you have to offer a discount to GLVAR members and produce a quality product. GLVAR real estate signs are manufactures in the LAs Vegas area by qualified sign shops. Traditionally, the “for sale” sign is a sign made with .040 aluminum that is capable of withstanding the weather conditions because it is considered rust proof because it is made with aluminum that does not rust. If made with steel or another form of metal, rust would set in after it would get wet. However, a new product is being introduced onto the real estate sign scene that is called a e-panel sign or composite sign. This substrate is a double sided aluminum panel with a filler substrate that allows for a more rigid and sturdy sign. The cost of the two signs is about the same. The average price of GLVAR real estate signs ( 18″ x 24″ aluminum) is around $30 a sign for a double sided sign. With GLVAR members being a member benefit partner with several sign shops in the area, the price goes down from that. A standard 10% off seems to be the norm for GLVAR members. GLVAR real estate signs can be purchased at any number of local sign shops in the Las Vegas area. Just check with the sign shop or the GLVAR to see if they are a member benefit partner to determine if they give discounts to GLVAR members.